23. Nancy Silverton- With the 1989 founding of La Brea Bakery, Silverton kicked off the Cali artisanal baking craze, and her same sourdough starter still seeds the more than 300 breads and rolls available through the bakery. Honestly, I didn't know much about Nancy Silverton last week. What I knew was that she'd written some cookbooks and that she was known for baking. But after digging a little deeper, I found out that she's done so much more than just write a few cookbooks and bake well. I am super impressed by this lady. What basically began as an afterthought and a side business (creating the perfect loaf of bread), ultimately put Silverton on the map. In what makes an amazing back story, she delved into food because she was enamored with a handsome "goateed, chanting-obsessed Buddhist in Birkenstocks. " Fortunately, by the time she realized that relationship wasn't going to work out, she'd found a new love- food. She decided to enroll in London’s prestigious Le Cordon Bleu. Her grades were just okay. And get this- her pastry grades were the worst of all of her grades. Yet, she worked as a pastry chef at Michael's in Santa Monica shortly after graduation...and she worked it well. That led to a Head Pastry Chef job offer from a young chef who was opening a new restaurant on the Sunset Strip. You may have heard of him and the restaurant...Wolfgang Puck and Spago? Oh yeah. Here she met the man she would marry (Mark Peel) and open Campanile on La Brea in 1989. This is where the business of bread began. Nancy wanted to bake bread to offer their dinner guests, and also sell the loaves as a side business. But she didn't want just any bread, she wanted perfect, complex, artisan bread. Six months and many loaves later, that "side business" La Brea Bakery took off. And it soared! She may still be the queen of sourdough. Here's where it gets crazy. Eleven years later, Silverton and Peel sold the business for $55 million...and cleared a little more than $5 million when all was said and done. Now that's good bread. She decided to invest her money. When her marriage fell apart she left Campanile and started Osteria Mozza and Pizzeria Mozza (w/ Mario Batali & Joe Bastianich). It was also around this time that she learned that she had lost everything that she invested...because she'd invested it with Bernie Madoff. She could have been bitter (I'm pretty sure I would have been), but instead she focused on all of the good things she had (like a job) and looked to the future to start building another five million...at least. She's a rock star in Los Angeles...and I'd say around the world, still consulting on La Brea Bakery and authoring eight cookbooks. And she's doing what she loves. game-changer, indeed. Well. I knew I was baking something this week. And once I came across the recipe for Parma Braids from Silverton's Pastries from La Brea Bakery cookbook, I stopped in my tracks. I needed these...and I needed them pronto! Making them entailed making croissant dough (and subsequently croissants....yay! ), so it was a win-win-WIN choice for me. They. Are. Heavenly. 8 oz. prosciutto, thinly sliced into 24 pcs. Divide the dough in half and return one half to the refrigerator. On a lightly floured work surface, roll the dough into a rectangle, 16½ x 7" and ~¼" thick, flouring the surface of the dough as necessary and lifting the dough to square off the edges and corners to help maintain a rectangular shape and even thickness. Trim the edges straight and brush off any excess flour. Working with the longer side parallel to the edge of the counter, cut the rectangle horizontally into two strips, each 16½ x 3½". Cut each strip into three pieces, each 5½ x 3½". Working with one piece at a time, place the longer side parallel to the edge of the work surface and gently score two horizontal lines across the center, 1" apart. 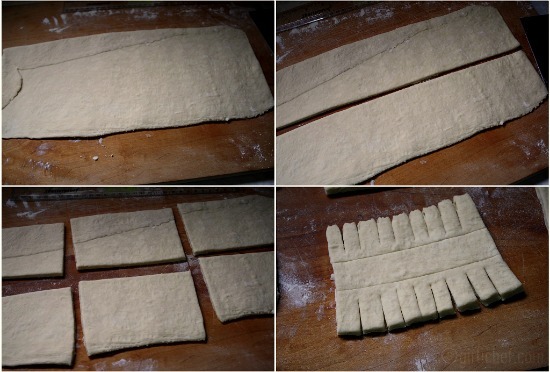 Make 8-10 cuts through the dough spaced ½" apart along the long edge, stopping ¼" away from the scored line. Repeat the cuts along the opposite side. Separate the strips slightly, so that they no longer touch. Place 2 pieces of prosciutto the same length as the rectangle on top of each and roll them up fairly tightly. 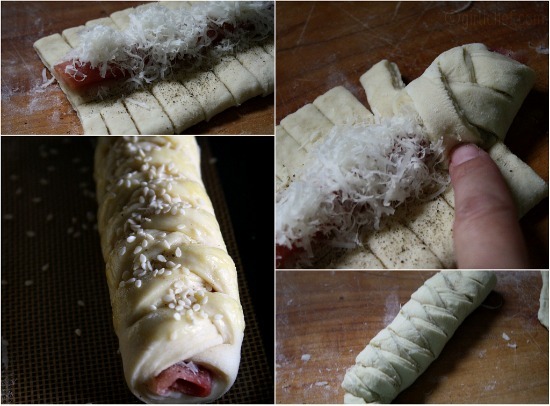 Place the rolled prosciutto inside of the two horizontal lines in the center of the dough. Grind as much black pepper as you'd like over the prosciutto and then sprinkle ~2 tsp. of the parmesan over that. Place the shorter side parallel to the edge of the work surface. make a crisscross pattern by taking the top right strip and crossing it over the middle to the edge of the prosciutto, stretching slightly if needed and using your fingertip to press gently into other side. Cross the top left strip over the middle to the other edge and so on all the way down the line...basically, like you're lacing a shoe. 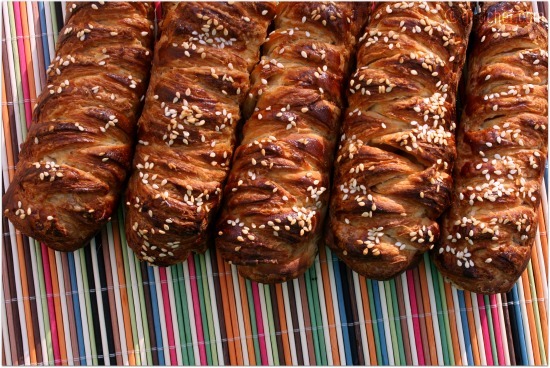 When you get to the two last pieces, tuck them underneath the bottom of the braided and gently press together. Your braid will be ~5" long and 1¾" wide. Place on a lined baking sheet and repeat with remaining dough and fillings. Set aside in a warm place and allow to rise until spongy to the touch, ~1 hour. Repeat with the remaining dough (from fridge) and toppings. Adjust the oven rack to the middle position and preheat to 425° F during the last 15 minutes of rise time. Brush the surface with the egg yolk and sprinkle a teaspoon of sesame seeds over each brain. Open the oven and spray well with a water bottle and shut the door. Open door again after a few seconds and slide sheet in; spray again quickly with the water bottle and close the door. Bake for ~25-30 minutes, until golden and crisp. These look beautiful. I'm intimidated by croissant dough, but adore it when someone else makes it. Thanks for linking up to Friday Food on Momtrends.com last week! Your parmesean buffs are beautibul! What an awesome job. Thanks to you, I am discovering many of the women on that list! And wowee you are an artist! Fabulous gorgeous work! I am so impressed. And I want to make these, too. These look awesome and relatively easy. Can't wait to try them. Good post. I was shocked that I had never really heard of Nancy Silverton either given how much she has done in the culinary world! She's insane! These braids sound a lot like something my dad makes for just about every holiday. Uber yum. Really interesting story. I had no idea she'd invested with Madoff. That's so awful. I've eaten at Pizzeria Mozza. Delicious. I am so impressed - by you and Silverton. You didn't pick as easy recipe and Silverton didn't take easy ways out. And of course Parmesan and prosciutto makes everything better. I am so impressed, Heather! First of all, your croissants turned out beautifully! And then to add Parmesan and proscuitto to the dough is a delight. Wish I lived next door. I bet your house smelled divine!! wow! qué hermosa manera de armarlo... qué delicia!! Those braids are gorgeous...I can smell the loaves now! These stopped me in my tracks for sure. Absolutely lovely! You did an awesome job, Heather. I wish I was munching on some of this buttery, salty heaven right now. That would be awesome. Always interested in knowing how to make better bread/bread items. Although, I have to say - I have seen your bread baking skills, I think you could throw down with Nancy! Yes, Kathy! If you click through to the croissant recipe (or look in the book), you will see a point at which it can be frozen. Or, if you want to form them before freezing, you could probably form and then freeze individually and then put them on a tray at room temperature for a few hours to rise before you want to bake them. I don't see why that wouldn't work! Your braid looks amazing! 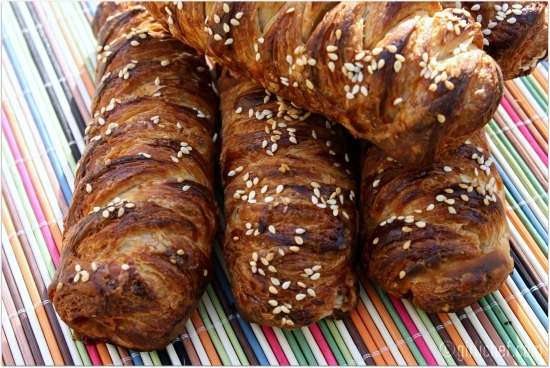 What a super job you did on your croissant dough. I actually plan on doing croissants this week and freeze them for Thanksgiving. I have never frozen them before, do you think they would do well? Great post! Happy Weekend! These are beauties and I can envision them stuffed with just about anything (ham and cheese rises to the top of my list, or how about Nutella or Bernard Callebaut chocolate). Great job this week Heather. You really rocked this weeks challenge. I know! I became an instant fan...I would really love to meet her. Or perhaps get some bread lessons from her- how cool would that be!? Omg, those bread looks absolutely divine. Heather, Nancy is really amazing. I realized that when I made the focaccia. That bread is so beautiful - prosciutto and parmesan - yum! Great write-up on Nancy Silverton, and wow, I am super impressed too - you are incredible! This braid looks amazing. Wish I could bake like you. Heather I'm super impressed. I was impressed by the croissants yesterday, but now I'm super impressed. 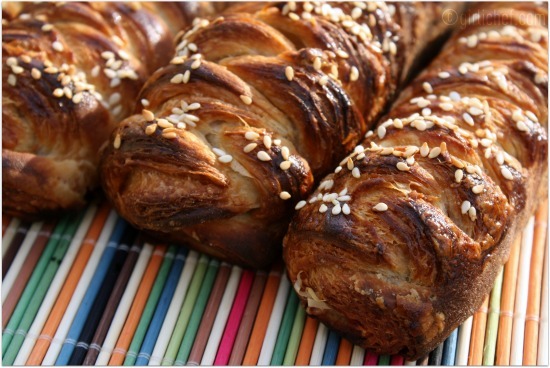 The braiding is beautiful, and to think, there's prosciutto inside. Are these supposed to be eaten like bread on the side, or a meal like a calzone? Either way I love them.